ActiveHistory.ca has an announcement! With contributors’ approval, Canada’s History will be selecting posts from the “Canada’s First World War” series on ActiveHistory.ca for inclusion in Canada’s Great War Album. The album is Canada’s History’s online tribute to people and stories from the war, and carries on from their book project that recognized the centennial of the war’s outbreak. The arrangement gives contributors to the “Canada’s First World War” series a chance to share their work with another community, and expand our collective discussion about the war’s history and legacy. This is also an opportunity to broaden the reach of ActiveHistory.ca, and continue its work of connecting the public with the past. To mark the start of this arrangement, we are running this post, in which Canada’s History answers some questions we posed via e-mail earlier this year. Q (The editors of the “Canada’s First World War” series) – Could you start with an introduction to our arrangement? A (Canada’s History) – Canada’s History is dedicated to bringing our audiences new ideas and perspectives of Canadian history. 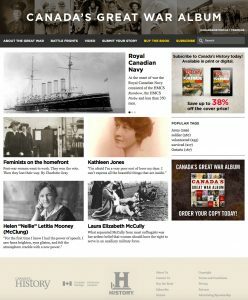 We recognize that ActiveHistory.ca provides a public platform for scholars to present and discuss their work and we hope to extend this platform across Canada using our websites and Canada’s History magazine. We understand that there are many stories within Canadian history and we want to make as many of them available to the public as possible. By working with ActiveHistory.ca we can continue to work towards this starting with the First World War. Q – What is Canada’s Great War Album? A – In 2012, Mark Reid, the Editor-in-Chief and Director of Content at Canada’s History, had the idea to ask Canadians to share their family stories from the First World War with us. At the time, the concept was to publish Canada’s Great War Album, a coffee-table style book featuring essays from prominent Canadian historians and storytellers, as well as stories from Canadians. It was to serve as a meeting place for the overarching narrative of the First World War and the personal experiences that had been confined to individuals. As the call for stories continued, Canada’s History received hundreds of accounts, images, and letters. We knew that they had to be made available to the public, so we created a micro-site, GreatWarAlbum.ca, to host these personal stories. We continue to accept new stories and make them available to the public. Q – Is Canada’s History addressing the centennial of the First World War in other ways? A – While Canada’s Great War Album is our most significant way of addressing the centennial of the First World War, Canada’s History has and continues to discuss the First World War in Canada’s History magazine, Kayak: Canada’s History Magazine for Kids and on our websites CanadasHistory.ca and HistoireCanada.ca in Canada’s History magazine and on CanadasHistory.ca (and in French, at HistoireCanada.ca). Additionally, our Online Engagement Coordinator, Jessica Knapp, works with communities to share histories and commemorative events with Canadians from coast to coast to coast. We always like to hear what communities are up to and encourage them to send us a note and a few photos too! For example, in the past year we have featured stories about an event commemorating the centenary of the send-off 109th Battalion of the Canadian Expeditionary Force in Lindsay, Ontario, the Billy Bishop Airport’s new pedestrian tunnel featuring installations about Toronto’s aviation history and its pioneers, as well as a Sharbot Lake Remembrance Day event that honoured Edward Nelson Badour, a First World War soldier from the community. 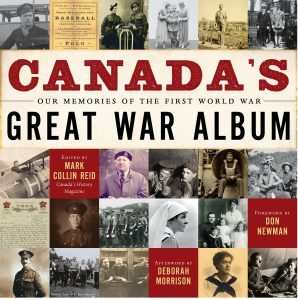 Canada’s Great War Album book cover. Q – Is the First World War a major topic of interest among your magazine’s readers, and the visitors to your website? Does there seem to be a significant difference between your print and digital audiences? A – The First World War is always a popular topic among readers — both print and digital. We publish articles that discuss the various aspects of the war, such as the role of women, life on the home front, transportation, technology, health issues, and more. There is overlap in the makeup of our print and digital audiences, but their engagement with us is different, even if they are presented with the same content. The simple explanation is that different platforms allow for different engagement. A letter to the editor in response to an issue of Canada’s History magazine might identify an error, express gratitude for a topic, or share an experience of the reader or their family. Whereas social media has shortened the lines of communication between publishers and readers, so we see responses to stories and discussion amongst readers more often. From these online discussions we gain additional insight to what our readers want to see from us and the stories they have to share. Q – Are there aspects of the war’s history that your readers respond to more than others? For example, how does interest in the war’s military history compare with the history of the home front? Is the memory, or legacy, of the war an important topic? A – We have dedicated military history audiences but with our recent influx of readers we have noticed there is a greater interest in social history surrounding the First World War. Both our print and online readers are very interested in how the war is publicly remembered. Q – The origins of your magazine go back nearly a century. Has Canada’s History reflected on the memory of the past as part of its engagement with the Great War? View of Canada’s Great War Album website. Q – Does it seem as if readers’ First World War interests have changed over time – recently, or longer term? A – Readers today take a more sophisticated approach to the war. Whereas it was once in vogue to publish combat-focused accounts of the battles, or profiles of the generals who ruled the troops, today, readers expect more exploration of the social aspects of the war — the effect it had on women, visible minorities, war resisters, and others who were “forgotten” by previous histories of the war. Readers also want to know more about the actual experiences of the fighters at the front — the conditions under which they fought, how they coped, etc. Q – Does Canada’s History engage in First World War programming with other groups? For instance, the “Education” tab on your website contains a wealth of resources and useful content. Was it developed in cooperation with educators? A – The Education Channel on CanadaHistory.ca was developed to share the lesson plans submitted by the Governor General’s History Award for Excellence in Teaching recipients and finalists. It also serves as a place for Canada’s History to share the many education resources that become available. Q – What interests Canada’s History in the “Canada’s First World War” series on ActiveHistory.ca? A – There is an endless number of topics within the First World War to discuss, even if we are only looking at events relevant to Canadian history; ActiveHistory.ca’s “Canada’s First World War” series contributes to this large discourse in a great way. They have created a space for academics and those who have trained in academia to publish their work in a public space. [Non-academics, too! Editors’ note.] These publications range in scope from personal histories to reviews and commentary on current commemorative events. We think the range in topic and the frequency that articles are published is really great. Since the centennial of the First World War will be commemorated for four years these newly published articles will need to be given new life as people continue to discuss the events. Canada’s History hopes to make this easier by providing access to larger audiences throughout the commemoration and beyond. ActiveHistory.ca is featuring this post as part of “Canada’s First World War: A Centennial Series on ActiveHistory.ca”, a multi-year series of regular posts about the history and centennial of the First World War. We welcome new submissions. Contact us at: canadasfww@activehistory.ca.